Putin Puts Shawl On China's First Lady, And Censors Leap : The Two-Way When Russian President Vladimir Putin moved to place a shawl over the shoulders of Peng Liyuan, the wife of China's President Xi Jinping, he set off alarm bells. Russia's President Vladimir Putin (right) helps put a shawl or coat on Peng Liyuan, wife of China's President Xi Jinping, as Xi talks to President Obama during a fireworks show celebrating the Asia-Pacific Economic Cooperation session in Beijing. What seemed to be an innocent moment during the APEC summit in Beijing has grown into a topic of debate, after China's censors moved to erase Russian President Vladimir Putin's act of placing a shawl over the shoulders of Peng Liyuan, the wife of China's President Xi Jinping. 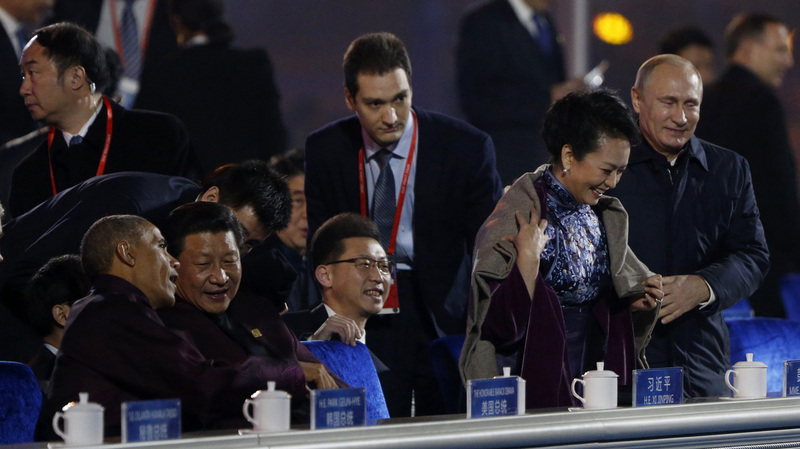 The gesture at a fireworks show Monday night was soon undone, as an aide gave the Chinese first lady a coat after she shrugged off the shawl (which some have described as a coat or blanket). But China's censors then acted to wipe the moment from the media landscape, as well. "A hashtag based on the same words quickly gained momentum on social media where the video was posted and reposted, according to Foreign Policy. However, by morning, there was little trace of it left." President Obama was also seated alongside the Chinese leader and his wife — but he was on Xi's right-hand side, and Putin was seated next to Peng. That created a scene in which the American and Chinese leaders were locked in conversation — and that's when Foreign Policy says Putin "made his move." The magazine unrestrainedly describes the incident as "Putin Hits on China's First Lady," calling the Russian leader a "Don Juan-in-chief." "It's happened before," the BBC notes, saying that the incident "served as a reminder to China's Weibo users that Russia's 'gallant' president had form. He once covered German Chancellor Merkel with a shawl at a previous G20 summit." Video of the moment shows how fleeting it was — and how quickly Peng replaced Putin's offered garment with her own. Of course, it's possible that the first lady merely didn't like the way the tan color looked with her dress. But it could also be that the image of Xi chatting away while another leader shows consideration for his wife clashed with the couple's carefully managed brand. "Propaganda officials have built the image of Xi and his wife as a loving couple," The Guardian reports. "Photos of Xi shielding his wife from rain on a state visit, picking flowers for her, or simply holding her hand have been circulated widely on China's social media." On Twitter, the hashtag #coatgate has inspired comments, with many people riffing on the Beyonce hit "Single Ladies (Put a Ring On It)." And in Russia, the Moscow Times notes that some are debating whether Putin, who was divorced this spring, was being thoughtful or flirtatious.